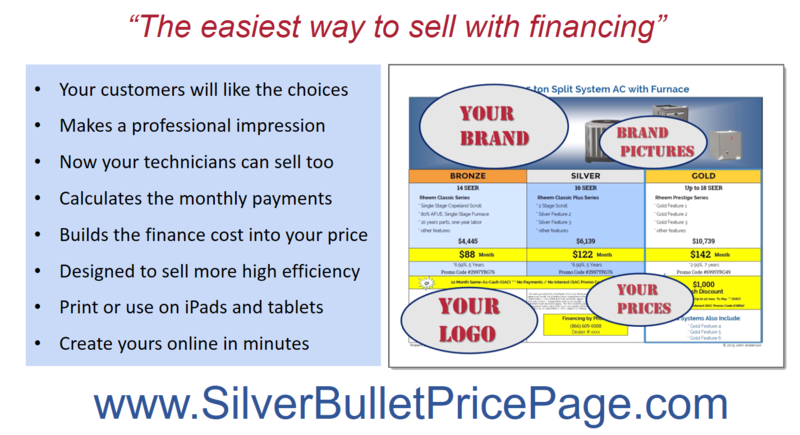 The Silver Bullet Price Page is "The Easiest Way to Sell With Financing". It lets your customers see their equipment choices and monthly payments in one quick view. it helps your sales people close more jobs and sell more high efficiency equipment than ever before. And it gives you total control of your pricing and profitability. Get professional results using the online Silver Bullet Price Page Template. You can set up and customize your price pages in minutes. Print or use on mobile devices. The monthly payments and financing fees are calculated automatically based on the EGIA financing clearinghouse program you are using. You have 24/7 access to edit or download your results. Versions are available for most popular equipment brands, and you can create separate pages for a wide variety system types. Get a 100% money back guarantee: “Print It, Use It, Like It”, or your money back.